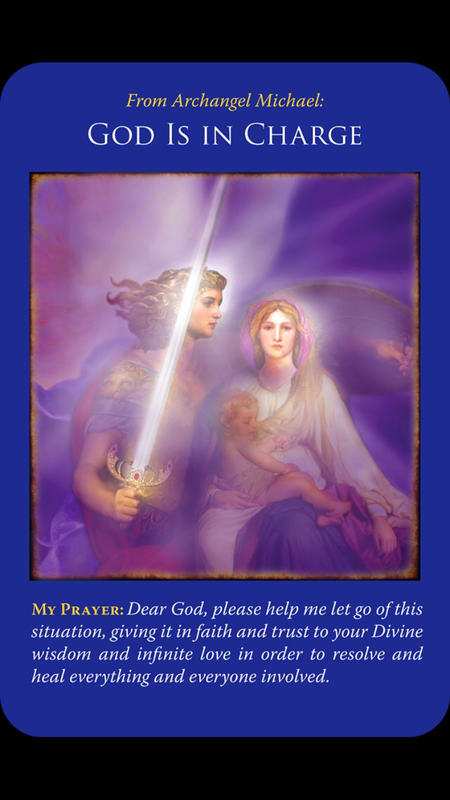 December 8, 2014 December 8, 2014 bcalvanocoachingLeave a Comment on Weekly Angel Oracle Card Reading for December 8 through 14. Weekly Angel Oracle Card Reading for December 8 through 14. 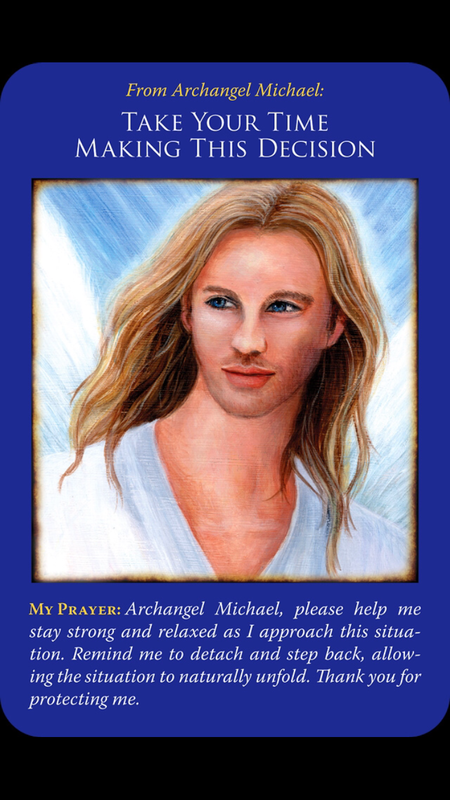 This week I was guided to use the Archangel Michael Oracle Cards Deck by Doreen Virtue. There’s no need to hurry and act without taking a moment to breathe and let go. The angels are aware of your situation. There’s no need to react. Your situation will be resolved by allowing the Universe and others to support you. By taking a mindful assessment of your situation you’ll gain more clarity as to what the next right actions are to take. You also need not worry that you’ll miss this opportunity as those in charge will still be available for you. Breathe! We are reminded that we are made in the image of the Divine Creator so we are not a victim. We have all we need to change a situation as we created it in the first place. It is a matter of getting out of the way and allowing for the helpful guidance to come through for you. The angels want us to know that we have great personal power. 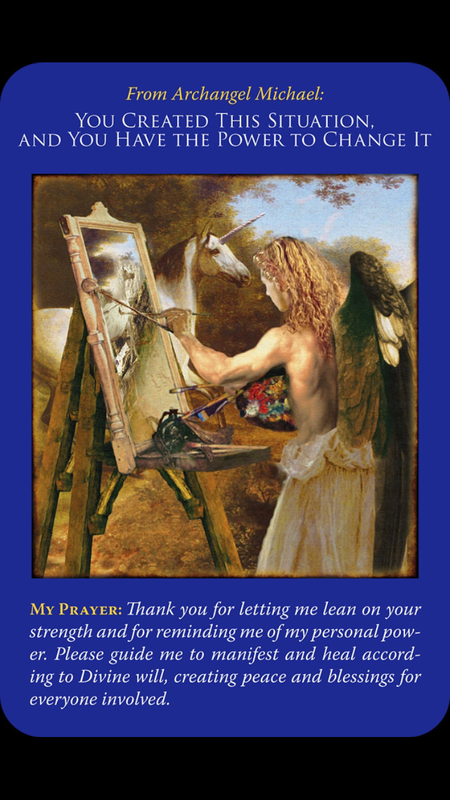 If you feel overwhelmed or stressed allow the angels to support you with their long guidance. The guidance comes in the form of messages and signs: thoughts, ideas, visions or images. We are to not to give away our power by blaming others for our circumstances. Take an action or two today towards changing your circumstances and fulfilling your dreams. Give yourself permission to make those healthful life changes you have been considering! Write down a list of actions you could take that could assist you in manifesting your dreams into reality. You have great personal power! Let’s use it to create positive joyous outcomes for you and the world. This is the final part of this week’s message. Let go and let God! Turn your problem over to the angels and God. Do your part and demonstrate to God and the angels your commitment to a situation by taking a positive action. Let go of your attachment to the outcome. Do your best and leave the rest as they say! Give all your concerns and worries over to God and the angels. Stop struggling against the flow. This is a powerful place to be – to be able to ask for help. Usually people do not get here unless they have really hit rock bottom or pretty close to it. Replace fear with faith and know that God is working behind the scenes for you. It’s important to know that things are going in the right direction because they are. You may be experiencing an upsetting situation and wonder how will you ever change it. Ask for help and then listen for the messages and signs from your angels. Then take an action without hesitation or delay. It’s a powerful week of getting present to a situation in your life that needs immediate change. Instead of reacting the angels ask us to take a moment, step back and breathe. Know that your prayers for a solution have been heard. All is being handled by God and the angels. We are reminded our immense personal power. We can move mountains with the help of God and the angels. Move from fear to faith. Let go and let God! Sessions are by phone, email, Skype babara.calvano10 or in person in Manhattan by appointment. My next live radio show will be Saturday December 13 at 4pm EST where you can call in for a reading at 424-675-6837. I look forward to having you join me! 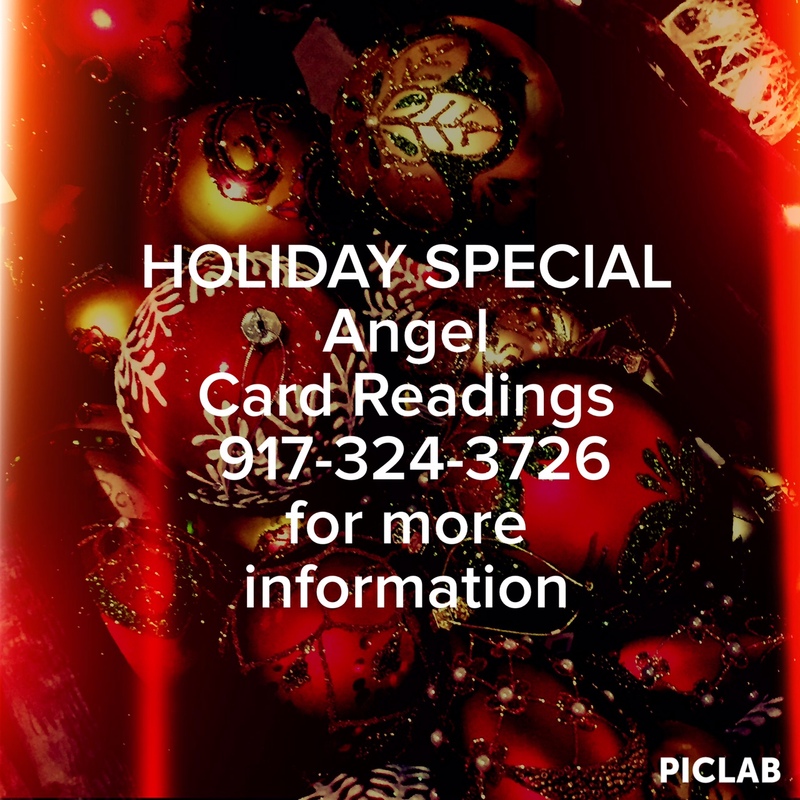 10am to 5pm 15 & 30 minute angel card readings Prebook your session and receive a discount. Holiday Special Rates through December 20! For all sessions contact me here or by phone for more information! Also available for your holiday parties! SUBSCRIBE TO MY WEEKLY ANGEL CARD READING WITH YOUR EMAIL TO PARTICIPATE IN MY MONTHLY DRAWING FOR A 60 MINUTE SESSION (valued at $110)! EACH MONTH I WILL GIFT A SESSION TO THE LUCKY WINNER! Winner will be contacted at the end of the month.